This week you get two Rushes of Remembering. Here is another item I purchased for $.25 because of the memories. This is a dog pillow. Animal shaped pillows were popular in the 1970s. We had three shaped pillows on our couch. We did not have this exact one, but it was a dog pillow. My favorite memory was when my Mom and Dad went out on a Saturday evening, we had babysitter, Jeri, who could sing but, we also played games. She would tie a cloth around our eyes and spin us around. With a large black button in hand we had to see if we could get the button on the nose of the dog pillow. I thought it was so much fun. Who says you can’t have a blast with a strip of fabric, a button and a pillow? Do you have any favorite memories from when you had a babysitter? This entry was posted in Childhood Memories, Junkin' Pickin' Finds by Karen Grosz. Bookmark the permalink. Such a sweet story! I can’t even think of any babysitter memories-ha! Ironically I just picked up this same pillow, for the same reason, for the same amount today! Yours is in much better condition, as the one I found is a bit faded with some age stains. 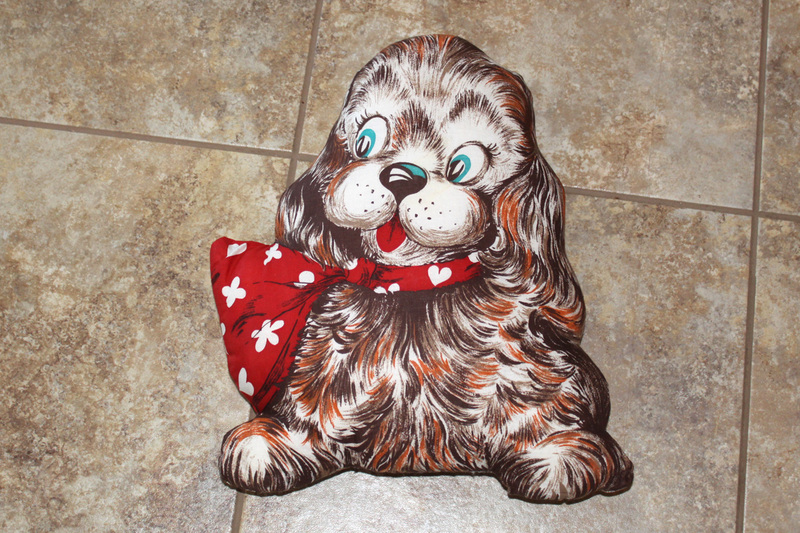 But I remember as a child in the 70’s having a Basset Hound pillow just like this one. I simply had to give this one a good home where it is appreciated for it’s throw back memory. The other item in my room at that time that I would love to come across again is a huge foot shaped bright orange shag throw rug. I loved that silly foot, and me and my friends would always set up a board game on the floor right on top of it. We were lucky to grow up in the 70’s. The last generation who used imagination versus electronics for play in my opinion. I didn’t have the foot shaped orange shag throw rug, but my friend did. Thanks for sharing.